This week was the final class of the first Wilton Cake Decorating Course. 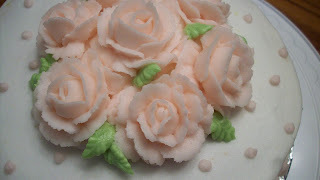 This week we learned how to complete the Wilton rose (yay I can now work at a grocery store bakery!) and leaves. I'm hoping to start Course 2 next week but as of now, I'm the only person who signed up so it will most likely be cancelled and I'll have to wait until next month. I'm having fun in the classes and really want to get farther along so hopefully its not delayed too long. For this class we had to bring in another layer cake, so I decided to try out another new recipe. I was a little limited on the ingredients I had on hand, but I found a classic pound cake recipe in my Mark Bittman How to Cook Everything cookbook and decided to make a lemon pound cake with a lemon curd filling from Martha Stewart. The cake came out a little dry - I think I over-beat the egg whites a little and should have added a simple syrup. I would also have liked the cake to be a little taller as the layers were quite thin even when baked in my 8" pans so next time I think I would make 1.5 times the recipe and add a 3rd layer. The lemon curd filling turned out to be fantastic and I will definitely be using this recipe again in the future. Preheat oven to 350 degrees. Grease and flour pans (I used 2 8" round pans) but the traditional recipe uses a 9x5 loaf pan. Combine dry ingredients in a bowl. Use an electric mixer to cream butter until its smooth. Add half the sugar and beat well. Add the remaining sugar and beat until light and fluffy. Beat in each egg yolk, individually. Mix the dry ingredients in by hand, just until smooth. Whisk eggs whites until soft peaks form and fold into batter gently. Batter will be thick. Pour into prepared pan(s) and bake. In a loaf pan, bake about 1 1/4 hours, for 8" pans it took about 30 minutes. 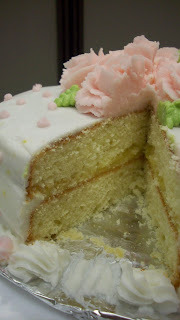 Remove cakes when a toothpick inserted into the center comes out clean. Let cool about 10 minutes and then remove from pan to a wire rack to continue cooling. Prepare an ice bath by filling a large bowl with ice and setting a smaller bowl inside. Combine egg yolks, sugar, lemon zest and juice in a small saucepan over medium heat. Stir constantly with a wooden spoon until mixture is thick enough to coat the back of the spoon (about 7-10 minutes). Remove sauce from the heat and add in butter, piece by piece, stirring with a wooden spoon until each addition is incorporated. Strain finished mixture through a fine sieve into chilled bowl. Stir occasionally until mixture is cooled, about 7-10 minutes. Cover with a sheet of plastic wrap placed directly on top of mixture to prevent a skin from forming. Refrigerate at least one hour. After mixture is cooled, level cakes and brush off any crumbs with a pastry brush. Smooth on lemon curd with a spatula, leaving a 1/2" space around the outside edge empty. 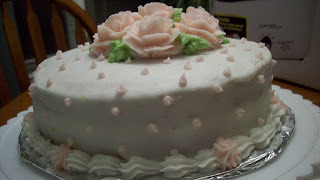 Top with 2nd layer and frost as desired. 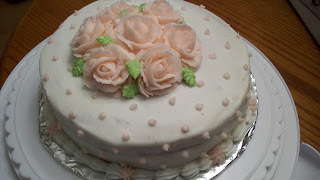 I used the Wilton buttercream recipe again which can be found here. I kinda like the roses! They look frilly and in full bloom :) But I understand what you're saying.